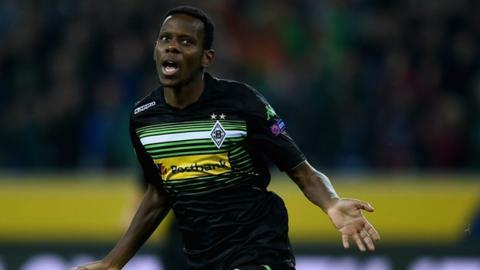 Ibrahima Traore has had to beg his German club Borussia Monchengladbach to let him play in Guinea's finals Africa Cup of Nations qualifying game. The club's doctor had concerns that he could contract the deadly Ebola virus. The Syli Nationale beat Uganda 2-0 to qualify for the Nations Cup finals, in a tie played in Morocco because of the Ebola outbreak in Guinea. "I told them that (Borussia Monchengladbach) I had to come and play for my country," he told BBC Sport. "The Nations Cup is an important competition for African players so I couldn't miss these two games that are really important for us. "When I came back to my club last time I was controlled (tested) and everything was ok.
"I spoke to the coach and the coach said it wouldn't be a problem. "He understood as a coach that I have to come, serve my country and play for them so I'm not worried about that, I don't think there will be a problem." Before Wednesday's victory Traore had said what a huge achievement it would be for the team to qualify against the backdrop of the turmoil in Guinea. "All the problems we've had will be worth it if we can qualify for the Africa Cup of Nations," he said. "I think it will be a big achievement for us and for all the people that are in trouble with their teams to come play for their country. "To qualify that would be a really big achievement - all the problems that we have been through as a team will be forgotten with the qualification."